Albert Einstein (14 March 1879 – 18 April 1955) was a German-born theoretical physicist. He developed the general theory of relativity, one of the two pillars of modern physics (alongside quantum mechanics). While best known for his mass–energy equivalence formula E = mc2 (which has been dubbed "the world's most famous equation"), he received the 1921 Nobel Prize in Physics "for his services to theoretical physics, and especially for his discovery of the law of the photoelectric effect".The latter was pivotal in establishing quantum theory. Sir Robert Robinson was born at Rufford, near Chesterfield, Derbyshire on September 13th, 1886, the son of William Bradbury Robinson, a surgical dressing manufacturer who invented his own machines for the production of lint, bandages, etc., and the cardboard boxes for packaging them. He was educated at the Chesterfield Grammar School, Fulneck School, near Leeds, and at Manchester University where he graduated B.Sc. in 1906 and D.Sc. in 1910. In 1912, he was appointed the first Professor of Pure and Applied Organic Chemistry in the University of Sydney. Albert Einstein 14 March 1879 – 18 April 1955) was a German-born theoretical physicist. He developed the general theory of relativity, one of the two pillars of modern physics (alongside quantum mechanics). 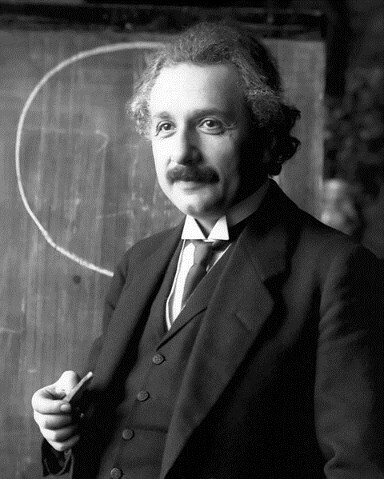 While best known for his mass–energy equivalence formula E = mc2 (which has been dubbed "the world's most famous equation"), he received the 1921 Nobel Prize in Physics "for his services to theoretical physics, and especially for his discovery of the law of the photoelectric effect".The latter was pivotal in establishing quantum theory.